Dungeon crawlers, for lack of a better word, often…crawl. 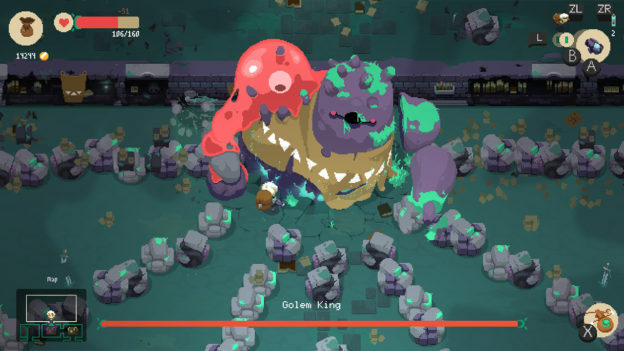 Moonlighter is no different, but there’s an elegance to the grind here. 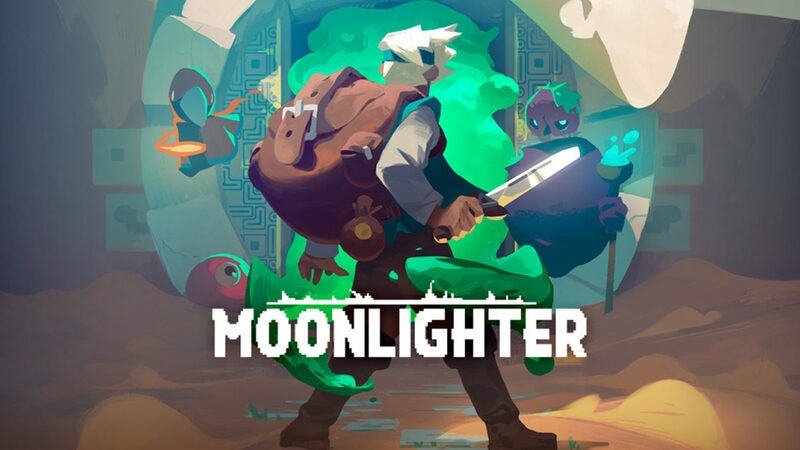 Moonlighter is an action RPG set in a world with ancient passages leading to different dangerous dungeons. However, unlike other top-down 2D crawlers, there’s a new untapped element here: shopkeeping. Yes, at the end of the day, the name of the game is racking in loot to sell to grubby customers. There’s a charming pace to the entire game. At night, you venture to a procedurally generated dungeon to slay monsters and collect the pricey loot they drop. Every new visit feels fresh, and it’s impossible to grab all you need in one go. Once your run in the dungeon is done, you open up your shop during the day. 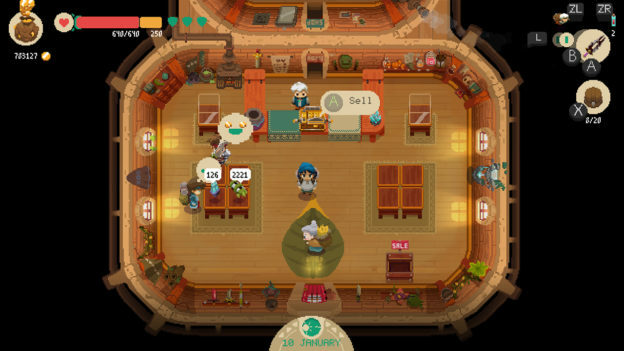 Customers storm your shop and drop cash on all the artisanal monster loot. Make sure you hoard some for yourself though, to build weapons, armor, and items for future dungeon runs. Rinse, and repeat. Combat will feel familiar to anyone who’s ever played a top-down RPG. There’s a myriad of weapons for you to craft, and in some cases, stumble upon. You’re allowed to keep two weapons on hand, switching at will using L and R. I prefer the two-pronged bow and arrow paired with a heavy sword for melee bashing. Maybe you prefer swift glove punching, classic sword and shield action, or poking enemies from afar with a spear. There’s a weapon and combat style for all seasons, all dungeons. And while I’m settled on my favorite, there wasn’t one weapon or attack style that wasn’t totally fluid and user-friendly. It’s a heavy burden, but along with conquering dungeon after dungeon, you’re also expected to help the town of Rynoka grow. Yes, charity begins in the home, and you can upgrade your own shop with different features to entice new customers. Eventually, they’ll even pay you a pretty penny for specific fetch quests. You can also invest in new shopkeepers that build weapons and armor, craft usable items, or even help you invest your hard-earned cash. Dare I say it, there’s whispers of Animal Crossing: New Leaf and Stardew Valley at the heart of this plucky little action-RPG. And while running a shop is a necessary chore that moves at a pace a little too slow for my tastes, the dungeon diving portions are infinitely satisfying. Normally, I scoff procedurally generated anything, as a lazy way of dodging making memorable levels. I’m happy to say every visit to the dungeons felt fresh, and while the secrets always vary, the patterns of enemies and loot will eventually be in your fingers. By the fifth, sixth, and seventh runs, you’ll have gathered tons of monster parts to upgrade your weapons and armor, and filled your sacks with too much gold that you’ll know what to do with. That is…until you reach the next dungeon. Then, the whole slow and steady pattern starts all over again. Not that it feels monotonous. Each character, each dungeon, each monster, each step is gorgeously designed with sprites, like the good old days. Granted, even Secret of Mana never looked this good.